On June 21 at the Keswick Theatre in Philadelphia, Pennsylvania, site of what was to have been that evening's sold-out performance of "The Mike & Micky Show" by Michael Nesmith and Micky Dolenz, tour manager Andrew Sandoval announced that Nez was ill and would be returning to Monterey, California to see his personal physician. The remaining shows in Philadelphia, New York, New York, Huntington, New York, and Red Bank, New Jersey were postponed. If you had previously purchased a ticket for one or more of these shows, you should have received an email from the venue or ticket agency confirming that your ticket is transferable to the new date. If you have more questions about the status of your ticket or VIP package, or you would like a refund, be sure to follow the directions sent to you in that email! In October 1971, Bell Records released Davy Jones' second solo album. The eponymous effort arrived during a challenging period in Davy's career. The Monkees last LP, Changes, had failed to chart a year before, and the group's television series (despite being a hit in syndication in the early 1970s), had been canceled in 1968. With a considerably lower profile, Davy struggled to find an audience in the immediate post-Monkees years. Produced by Jackie Mills and arranged by Al Capps, the album yielded a couple of singles (and two more additional non-LP singles would follow on Bell). "Rainy Jane" was issued in May 1971 and backed with "Welcome to My Love." The lead single ended up achieving moderate success, peaking at #52 on Billboard, #32 on Cash Box, and #31 on Record World. The second single taken from the album, "I Really Love You"/"Sitting In The Apple Tree," was less successful, peaking at #107 on Billboard, #96 on Cash Box, and #106 on Record World. The B-side was written by Doug Trevor of The Cherokees, the group that opened for The Monkees in Australia in 1968. The opening track, "Road to Love," easily qualifies as a highlight from the album. It was later selected as the B-side of the non-LP single "I'll Believe In You," released by Bell in early 1972. The single failed to chart. It's well known that Davy did not enjoy his association with Bell Records. He often vocalized his disdain for the Bell experience, claiming his talents were misused and that he was never given the opportunity to grow as an artist while under their auspices. ​He ultimately left Bell and later recorded for MGM Records throughout 1972. "Davy still had one more disaster to go before he finally broke with Screen Gems in 1971. They got him a deal to do one album on Bell, with Screen Gems publishing. He was teamed up with Jackie Mills, Bobby Sherman's producer, who still saw Davy as a bubblegum singer. He wouldn't allow him to break out of that mold into something a little more challenging, in the way that he was attempting to do with his live shows. The result was one more unoriginal piece of vinyl, from which four singles were released. Only the first, 'Rainy Jane,' made any impression on the charts. "Davy was very upset with the way the whole thing was handled. He didn't have a manager at the time and was therefore at the mercy of the record company executives. He asked for just his picture and name to be on the cover, but he obviously didn't ask loudly enough. They put out a cheap-looking thing that had the song titles and company logo on the front cover. Davy complained, but to no avail." The Davy Jones Bell album was eclipsed in time by Davy's iconic appearance later in 1971 on The Brady Bunch, where he sang the song "Girl." Despite being promoted by Davy's guest spot and in the movie The Star-Spangled Girl, as a single it failed to chart. But the song's legend has grown to iconic status through the years thanks to countless reruns of the "Getting Davy Jones" episode and its inclusion in Monkees concert set lists in the 1990s and early 2000s. 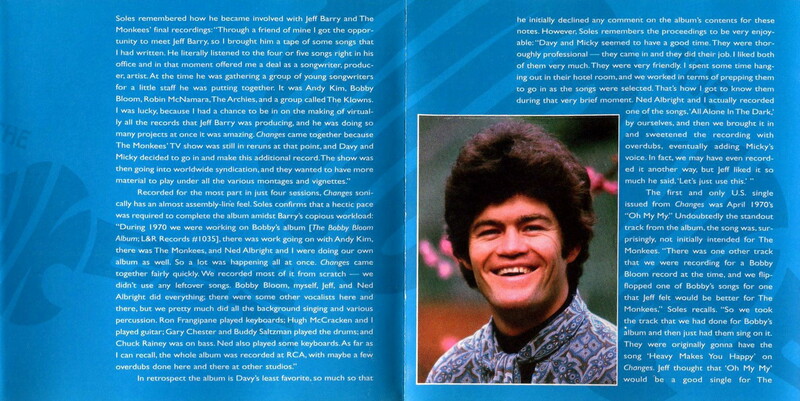 Davy also appeared in the 1995 cinematic version of The Brady Bunch where he sang "Girl," albeit in a new, grunge-like version. In 2012, Friday Music released The Bell Recordings on compact disc, which collected the original 1971 Bell album and the singles recorded during that era. It is currently available to download on iTunes and can be streamed on Apple Music. Thank you very much to Ben Belmares for the scans of Davy's Bell album! This past June, Davy's daughters Talia Jones Roston, Sarah Jones McFadden, Jessica Cramer Jones, and Annabel Jones formed Along Came Jones Media to assist in the preservation of their father's legacy. The organization's initial Facebook post designated a book as their debut project, and fans will be happy to know that When the World & I Were Young: Snapshots from the Collection of Davy Jones will be available this September! The cover appears below, and a description of the book follows. UPDATE 9/5/2018: When the World & I Were Young: Snapshots from the Collection of Davy Jones is now available from Amazon. ​In the summer of 1967, The Monkees hit the road for their first major concert tour. With the success of their hit TV show energizing fans, they were greeted with screams, hysteria, love, and applause everywhere they went. It was a lot for four young guys to take in. Fortunately, they all had cameras—Kodak Instamatic 104s, to be exact! From June through August, The Monkees were on the go-go. Beginning at the Hollywood Bowl, the tour took them from LA to London and everywhere in between. Along the way, they introduced the US to one of their most ground-breaking opening acts: The Jimi Hendrix Experience! Whether you were there, or just wish you had been, this rare collection of candids brings the summer of 1967 back to life. Featuring many never-before-seen images of The Monkees, their friends, and even some of their fans, When the World & I Were Young - Snapshots from the Collection of Davy Jones is a treasure that captures the excitement and spirit of the Summer of Love as only The Monkees could have experienced it. Enjoy this groovy trip down memory lane with one of the hottest groups of the era, The Monkees! The Monkees visited the historic Ryman Auditorium in Nashville, Tennessee when they were guests on the July 19, 1969 edition of The Johnny Cash Show. The trio sang Michael Nesmith's "Nine Times Blue" in an appearance that was filmed earlier that May. Micky, Davy, and Mike were joined by Johnny Cash after their performance of "Nine Times Blue" for a comedic take of "Everybody Loves a Nut," originally featured on Cash's 1966 novelty album. ​And now, the digital television network getTV is airing The Monkees' appearance on The Johnny Cash Show on August 12, 2018 at 10pm EST. Of note, portions of the Pisces, Aquarius, Capricorn & Jones Ltd. album were also recorded in Nashville, along with treasured Monkees cuts like "Listen to the Band" and "Good Clean Fun" during Michael's famed '68 Nashville sessions. Be sure to check out this great article detailing the history The Monkees have with the city of Nashville. And a little bit of trivia: Micky and Michael returned to the Ryman with Peter during the group's 2013 summer tour.